Lol... dunno. 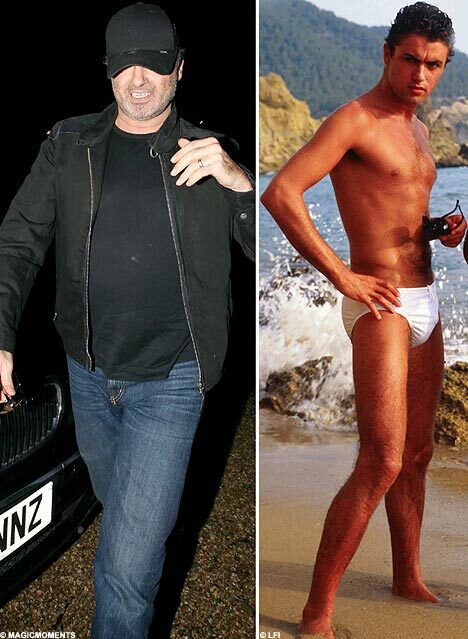 Wonder if George Michael still wears swim bikinis to this day, with his 'nice' pot belly. That picture was from 2008. He's 51 now. I wouldn't think so. Looks like that white speedo shot is from this old Wham video. I don't know to embed but the song is Club Tropicana. Here is an old interview in 1986 where he is still pretending to be straight and Joan Rivers is totally playing along. Joan set him up with Brooke Shields back then and wonders why it didn't work out. Lol. The Whole show is on this clip and it is really good old stuff. Last edited by sprynkles; August 10th, 2018 at 08:51 PM. I didn’t know she had her own late show. Of course, back then I was 7, and in bed by then. I know she had a talk show in the early 90’s. At the very least people might have thought he had a weird walk. Or maybe they thought he was doing the Monty Python's "Ministery of funny walks", because when he walks in, he does walk kind of funny. Cynic and Soj and Lily,Venus and so many lost peeps..it makes me sad.GR is not the same without them.I miss them . ^ I agree except for Lily I think. Wasn't she always fighting about singers or Brangelina or something? I went to the beginning of the thread and was thinking that "fat" pic really isn't that bad considering what he ended up looking like. He actually looks pretty healthy there though I get this must have been the very beginning of his downward spiral?